Leveraging on the vast industry experience, we have been able to cater to the diverse requirements of the customers by providing them with a broad array of Electrical Accessories. 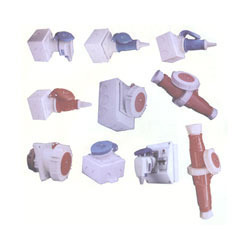 Under this range, we offer Plugs & Sockets, Cam Operated Rotary Switches, LED Module indicating Lights and Engineering Plastic Junction Boxes. The products are widely appreciated for their attributes such as efficiency, high speed, sturdy construction, durability and excellent performance. A terminal is the point at which a conductor from an electrical component, device or network comes to an end and provides a point of connection to external circuits. Aterminal may simply be the end of a wire or it may be fitted with a connector or fastener. Looking for Electrical Accessories in Pune ?